How are we to think of God's providential action in the world? 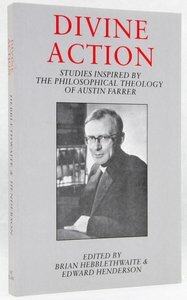 This question lies at the centre of philosophical theology today and is the theme of this collection of specially commissioned studies.Austin Farrer's contribution to our understanding of divine providence is still the most acute and penetrating in post-war philosophical theology. The contributors illustrate the range and fertility of Farrer's influence on British and American philosophical theologians today, and explore various possibilities for articulating a theory of divine action that has emerged in recent theological and philosophical debate. Brian Hebblethwaite is a Life Fellow of Queens' College, Cambridge. Among his publications are "Evil, Suffering and Religion "(revised edition, 2000), "The Essence of Christianity "(1996) and "Ethics and Religion in a Pluralistic "Age (1990). Edward Hugh Henderson is the Professor of Philosophy at Louisiana State University and the co-editor with Brian Hebblethwaite of Divine Action: Studies Inspired by the Philosophical Theology of Austin Farrar.